Seat Covers - CarCoverUSA, Inc.
Coverking Seat Covers Custom made in USA, for cars, trucks, Vans & SUV's. Coverking Custom Car Seat Covers Ultra custom, perfect fitting slip on seat covers custom fit for a specific vehicle. All knobs, levers, adjustments and airbag areas pre-cut ! All headrests, armrests, are fully covered, console covers are covered on truck and SUV bench seats but not on separate bucket style seats where the console is not attached to the seat. The best fitting & looking custom seat covers available, Coverking custom seat covers protect the original upholstery from damage, cover up existing damage, and provide a more personalized look to your vehicles interior. Coverking seat covers are designed to look & fit perfectly. Because many seats have reclining, folding and removal features, Coverking custom seat covers allow complete use of the seat features. Coverking always includes console covers for split bench seats, and map pockets. Coverking custom seat covers also have provisions for side airbags. Coverking insists on testing its materials, and offers a wide selection of colors and patterns to view below. CalTrend Seat Covers - Caltrend Car Seat Covers - Made In USA ! CalTrend custom tailored seat covers are designed with a state-of-the-art CAD/CAM computer system to ensure that the seat cover fits perfectly and is easy to install. 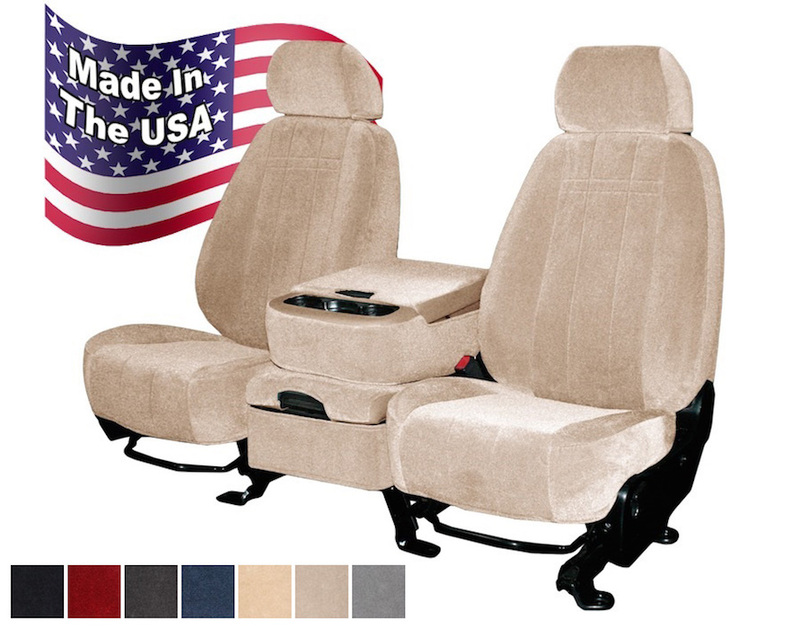 All seat covers are proudly made in the USA in Santa Ana, California. CalTrend uses high quality materials for long lasting use and offers seat covers in a variety of colors and combinations. Every cover comes with the appropriate headrest, armrest, and console cover at no additional cost. With its strong commitment to manufacturing premium custom tailored seat covers, CalTrend has been holding the leading industry position for more than 20 years. Today the company is well-known as the Nation's leading custom seat covers manufacturer that has kept its entire manufacturing in the USA. To ensure a perfect precision fit of every CalTrend seat, they use Gerber computerized CAD/CAM system during design and manufacturing processes. Seat Savers from Covercraft are the best, quick and easy way to protect the seats in your pickup or SUV. Covercraft Seat Savers slip on and off in minutes, providing protection against dirt, spills, kids, pets, outdoor adventures or everyday wear and tear - and when soiled, just throw them in the home washer and dryer. Seat Savers are custom patterned for front seats, back seats and 3rd row seats, plus they have cutouts provided for seat adjustment knobs, shoulder belts in seatbacks and fold-down armrests. All Covercraft Seat Saver covers are easy to clean at home, and no tools are needed to install or remove them. Your original seat material will be protected from harmful sun & UV rays while the fabric breathes eliminating the wet sticky back so common with other type of seat covers. Seat Savers heavy duty poly cotton drill weave fabric features overlapped and double stitched seams for durability and is protected with a water repellency finish that blocks liquid from reaching your seats. Seat Savers are available in 4 different materials & the color choices below.